Malaysia is one of the best countries for buying a home. Why? Because you can enjoy a great quality of life, especially if you choose to live in Penang. As you may already know, Penang is one of the most beautiful and amazing places in the world. But with all the new housing developments in Penang, it can be difficult to know which one to choose. So read on to learn all the things you need to know before buying a home. If you want to buy a residential house or apartment in Penang, get to know everything about the properties and the developers. Also take a good look at the neighbourhood and other properties found there. Let's take a look at the three most popular places in Penang to buy a house. It is a popular destination for people who want to retire in Penang. Batu Ferringhi has everything you need from restaurants to outdoor activities, and is considered very relaxing and laid back. Here you can find a decent unit of condominium for a minimum investment of RM 1 million. There are 3 bedroom condos with an initial price of RM 500,000. George Town offers a diverse local culture and many attractions; it is almost impossible to dislike this place. Here you will find old shophouses and townhouses, and many people buy these instead of condos. But if you are looking for a great place to live in a new housing development in Penang, you should really need to take a look at Jelutong. 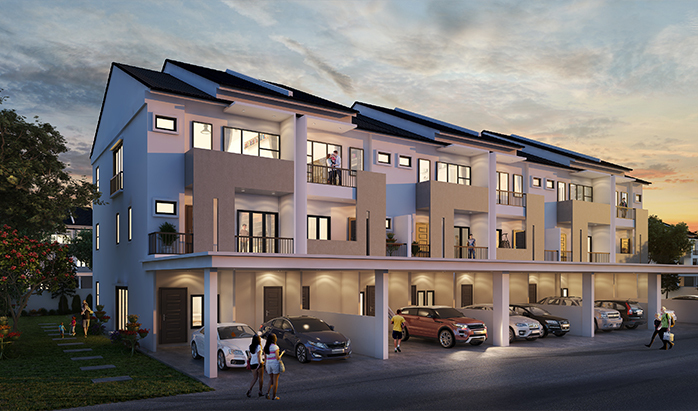 Jelutong is a suburb of George Town where you will find amazing properties developments like Artis 3. Artis 3 is combination of aesthetics, lifestyle and great location. Butterworth or the Mainland is expanding rapidly as the prices increase on the Island, and many people are looking for investments opportunities here. New properties in the Mainland are cheaper compared to the island of Penang. You can find a 3 bedroom condo with 2 bathrooms for RM 400,000. You decide you want to buy a home and you know where you want to live. It is time to learn how the buying process works. Find out everything you can about the process, including loans, payments, and mortgages. As you are buying your first home, don’t get too emotional, it’s best to analyze sensibly and get opinions only from trusted source. If you are going to buy a new house, it is a good idea to avoid rushing it and making risky purchases. You can make a good inspection with professionals before buying the property to avoid any problems. For example, bring along a renovation person for inspection to avoid any potential water leakage in the house or other related issues. Generally, it is not a wise idea to buy a home without a down payment. If you pay a down payment, you will get a better rate, smaller mortgage payments and it will be easier to become qualified for a loan. As long as you are going to save for the down payment, it is always a good idea to get your finances in order. This way you can become qualified for a mortgage and get the lowest rates. Check out the new housing developments that you can afford, based on your current income and debts. It is better to spend on the down payment and still have a fund reserved for unforeseen circumstances. When you are searching for a new house development, don't feel pressured to make an offer. Take your time, look around, remember you will be living there for a long time. Only when you found the home of your dreams, sign the deal. If you are looking for a property in Penang, take your time to research each location and find the one for you. Remember you live by the choices you make, so if you make a right choice you will enjoy your home every day.